Amendment 73 would change the state constitution and state law on how tax revenue is raised to fund public education, from preschool to grade 12. Amendment 73 would establish the Quality Public Education Fund. Money from the fund would supplement public education funding appropriated through the general fund. The measure is projected to raise $726 million in FY2018-19 (a half-year impact) and $1.6 billion in FY2019-20, according to the Legislative Council Staff’s initial fiscal impact analysis. Amendment 73, for the purpose of public education funding, would eliminate the flat tax. It would raise individual income taxes in a graduated, progressive manner on taxable income greater than $150,000 per year. It would increase the corporate tax rate to from 4.63 percent to 6 percent. Revenue raised would be exempt from TABOR limits. Amendment 73 would lower the residential property tax assessment rate for residential property taxes levied by school districts. For all other taxable property, the measure would lower the assessment rate for property taxes levied by school districts. Amendment 73 was known as Initiative 93 during the initiative process. Initiative 93 gathered enough valid signatures to be referred to the ballot. To pass, Amendment 73 would need to garner 55 percent approval from voters. A “yes” vote supports Amendment 73. A “no” vote opposes the measure. Amendment 73 creates spending requirements for several public education programs. 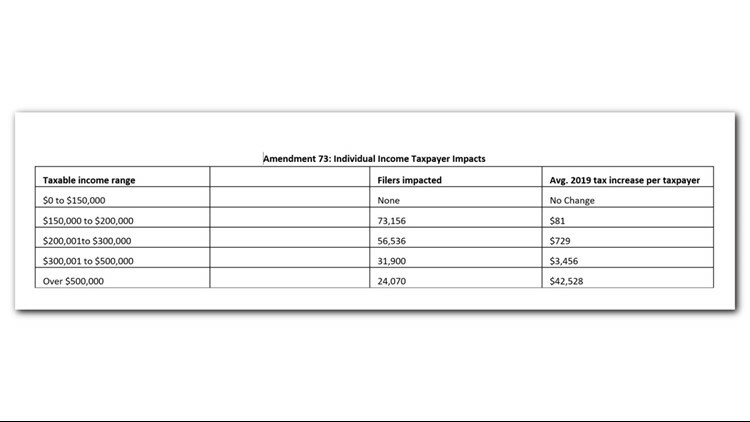 Amendment 73 would create new individual income tax brackets, with higher earners paying a greater share. Individuals whose taxable income is less than $150,000 would not pay any additional taxes. Corporate income taxpayers with an income tax liability (meaning those who owe taxes) will pay about $11,085 more per year, according to the Legislative Council’s initial fiscal impact statement. Starting Jan. 1, 2019, the assessment rate for residential taxes levied by school districts will drop from 7.2 percent to 7 percent. The assessment rate for all other property taxes levied by school districts will drop from 29 percent to 24 percent. Property taxes levied by local governments will be subject to law that determines the residential assessment rate.